Continuing on the theme of classic India, in the last couple of months, I also received a large lot of India and States from a trading partner. While checking my albums, I noticed an interesting difference between the old Scott brown-cover Internationals and the later blue-cover Internationals. For whatever reason, the brown-covers include spaces for the stamps of the Convention States, but only blank pages for stamps of the Feudatory States, while the blue-cover album includes spaces for the stamps of the Feudatory States, shown below, and only blank pages for the stamps of the Convention States! Jim (jkjblue ), given your in-depth study of the Scott "Big Blue" 1840-1940 album, are you able to comment about this difference at all? I am curious to know if you have any insights that you could share. 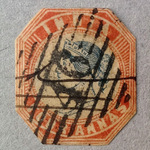 As it happens, the coverage of spaces for the Feudatory States is fairly limited, including selections from: Charkhari, Cochin, Hyderabad, Indore, Jaipur, Kishengarh, Sirmoor, Soruth, and Travancore, with spaces for stamps issued from 1885-1931. As with my posts on classic France and India, those familiar with these pages will see that I have once again taken some liberties in the use of these spaces to accommodate mounting as many of my stamps as possible. "It is our choices .... that show what we truly are, far more than our abilities." For whatever reason, the brown-covers include spaces for the stamps of the Convention States, but only blank pages for stamps of the Feudatory States, while the blue-cover album includes spaces for the stamps of the Feudatory States, shown below, and only blank pages for the stamps of the Convention States! Jim (jkjblue), given your in-depth study of the Scott "Big Blue" 1840-1940 album, are you able to comment about this difference at all? Beryllium Guy - Good pickup! I never noticed that before. Yes, the 1929 copyright Brown International 1920-29 volume album gives detailed coverage/spaces for the Convention States (nine pages), but relegates the "Protected States" to one blank page, where one was supposed to put the stamps of Barwani, Cochin, Duttia, Hyderabad, Indore, Jaipur, Kishengarh, Soruth and Tranvancore. My 1943 copyright Big Blue, on the other hand, provides one blank page for the Convention States (Chamba, Faridkot, Gwalior, Jhind, Nabha, Patiaia), while providing more coverage for the Feudatory States (even if somewhat limited) on three pages. I don't know the editorial reasons why Scott provided different approaches/spaces for Big Brown and Big Blue. Perhaps it had to do with the earlier copyright for the Big Brown albums, and different priorities by the collector of India at that time? Jim, thanks for your quick response on this question. You may well be right in your observation about different collecting priorities at different times with respect to India States--at this point, hard to say what the rationale was. 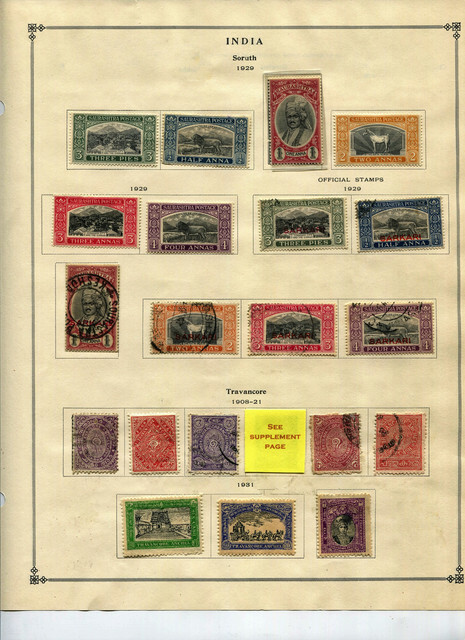 Originally, when I noticed that the 1929 "Big Brown" only had spaces for the Convention States issues, I figured that it was because the Convention States were all overprinted stamps of British India, so it made some degree of sense to me, since all of the underlying stamps were already included in the albums. But when I recently realized that it was the exact opposite in the "Big Blue" by 1969, and the Feudatory States had the spaces when the Convention States did not, I was confused.... I guess I still am. I can confirm again when I get home in early January, but I believe that in my 1928 and 1930 blue-cover Scott International Jr. albums, both the Convention and Feudatory States got only blank collective pages with no spaces for specific stamps. This all seems a real shame to me, as a few more pages to cover these issues should not have been a problem in publishing the album, and there are notably no other stamp-issuing entities treated in this way in the Scott Brown or Blue International Albums. Keep calm and collect stamps!! Is there any online resource for Indian state stamps (on lines of StampWorld.com? Is there any online resource for Indian state stamps (on lines of StampWorld.com)? The nice thing about these blog pages is that Jim also provides links to other sites which are related to the subject he is covering. Hopefully, Jim will see this post and add more comments if he has any. The Indian States stamps are a whole world onto themselves, and one can spend a lifetime exploring them. Thanks Beryllium Guy for recommending my blog posts about the Indian States, but I agree, they are only a start. For a deep, but perhaps chaotic dive into the Indian States, there is a stamp forum in the southern hemisphere where a fellow from Melbourne with a board handle of tonymacg holds forth on the "Uglies". During the last ten years, he has had over 11,000 posts on this topic, so that ought to keep one busy for awhile. I'm a little late with a post on this thread, but thought you'd like to know that later this year I will be posting 26 pages with 662 Convention and Feudatory stamps in the "Bud's Big Blue" section of jkblue's blog (http://bigblue1840-1940.blogspot.com/). They're organized pretty much by Scott numbers. I hope you find the scans useful. Is there any chance you could post them here? We'd love to see them here. Hi, stoltzpup! It's nice to see you on TSF again! I have read many of your older posts, but this is the first one you have made since I joined the Forum in Nov-2016. Glad to see you back, and I hope, like Londonbus1, that we will get to see some posts of your India material here. OK. 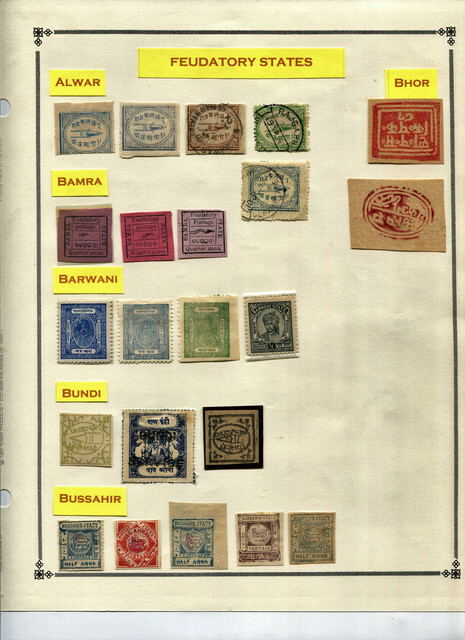 Here are the scans of India Convention and Feudatory stamps in my collection: first the pages Scott International affords them (all Feudatory, no Convention), then a series of supplementary pages with stamps that Scott does not include, organized by state and more or less by Scott numbers. These will follow in several postings. Here follows India Conventions States, part 1 of 2 posts. Now follow the India Feudatory pages, 13 of them broken into three posts. Enjoy. Five more pages of India Feudatories. Last three pages of the India Feudatories. As mentioned in an earlier post, these and all other stamps in my pre 1940 collection are appearing, ad seriatum, in "Bud's Big Blue" section of jkblue's blog (http://bigblue1840-1940.blogspot.com/).